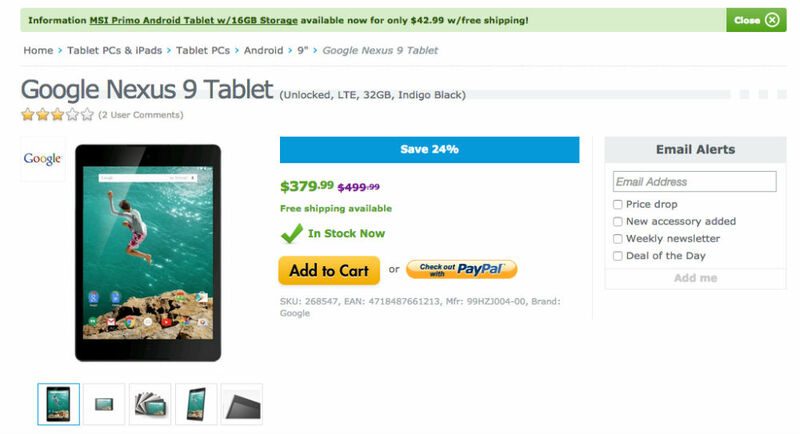 For who knows how long over on Expansys, you can purchase a new Nexus 9 LTE tablet with 32GB of storage for just $379.99. Considering Google sells a similar LTE model on the Google Store for $599 and Expansys normally wants $499, this is a pretty sweet deal. The Nexus 9 is powered by a 64-bit Tegra K1 processor and 2GB of RAM, featuring a very nice 8.9″ QXGA (2048×1536) display, 8MP rear-facing camera, and 6,700mAh battery. Given it is a Nexus, it should be one of the first devices to receive an official update to Android M upon its release, so that’s exciting. Plus, this is the LTE variant, meaning you can slap a SIM card in there and do your browsing from wherever, no WiFi needed. To take advantage, follow the link below. Edit: This international variant doesn’t appear to support AT&T’s band 17 LTE, just FYI. It also won’t work on Verizon.